Cozy with a wide seat this chair with ottoman set can update an empty corner of your living room. 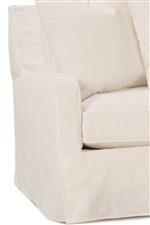 Both pieces feature a slipcover which makes it easy to change, clean and adds comfortable style. Sit your feet up on the ottoman to be relaxed from head to toe. The Havens Casual Chair and Ottoman Set by Robin Bruce at Reeds Furniture in the Los Angeles, Thousand Oaks, Simi Valley, Agoura Hills, Woodland Hills, California area. Product availability may vary. Contact us for the most current availability on this product. Havens-068 Chair 1 40" 43" 36"
Havens-005 Ottoman 1 26" 23" 21"